In the world of reclining chairs, the Maverick, with its bucket-style seat, has already won many adoring fans. 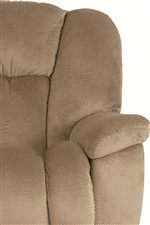 And now, those fans can enjoy the same comfort with friends, thanks to the new Maverick loveseat. The epitome of comfort, the entire Maverick sofa group brings a subtle charm to any room. 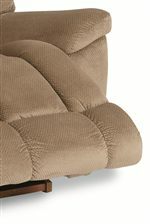 Comes standard with a wall-saver mechanism and interdependent footrest and backrest motion. The Maverick Power-Recline-XRw™ Full Reclining Loveseat with Drink Holder and Storage Console by La-Z-Boy at Jordan's Home Furnishings in the New Minas, Halifax, and Canning, Nova Scotia area. Product availability may vary. Contact us for the most current availability on this product.